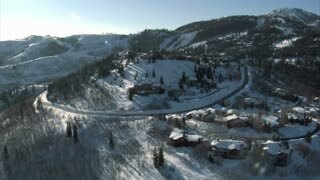 Aerial view flying past Big Horn Sheep towards deer running in the snow up hillside in Utah. AERIAL: Flying past rocky cliff towards meadows and hills overgrown by woods. AERIAL: Flying past majestic limestone cliffs and towards tropical sandy bay.